Believe me these roads are full of gravel and rough surfaces and irregularly engineered corners. This is not an easy place for fast descents. The area is dramatically green with very steep valleys. Sharp mountains and sharp roads. Every turn takes their full attention. And mine, stay upright Jens! Laurens ten Dam and Jens Voigt are both back on their bikes and riding. #132 BONNET, William (FRA) FDJ finished outside the time limit today. What we cannot see in the TV coverage are the pesky painful horseflys in this area of the Pyrenees. 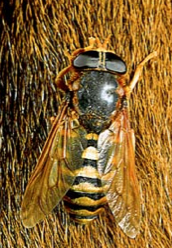 The french horsefly, nasty creatures. 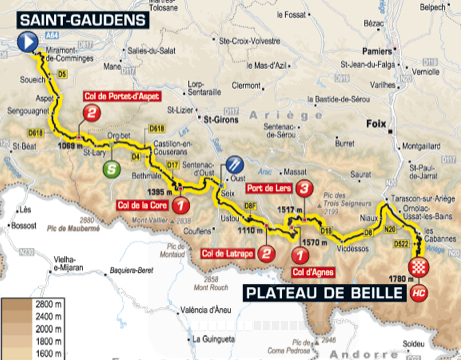 I by now have climbed most of the climbs I had intended to climb in the Pyrenees. I have decided I am going to create a new rating of all these climbs in the Pyrenees and rate them with a Horse Fly rating of 1 to 5 (forget HC,1,2,3,4). I am also going to rate these small towns according to size, with a car symbol rating them by fat truck to itsy-bitsy you really think you can drive through there. I am becoming more paranoid about driving in these tiny towns and over the cols. Give me a peage or a big city please! In week one I arrived appreciating the beautiful butterflies and all God's creatures great and small. By week four I am swatting at anything that moves. Flys, butterflies, cows, donkeys, anything. "Out of my way, I am climbing to the top of this Col at 4mph (or, maybe, slower) and nothing will stop me!" Which reminds me, I actually saw a herd of donkeys yesterday. I didn't know donkeys could be herded. Although the Shepherds were screaming at them as if they too were doubting whether donkeys could be herded.